Time 6:00 PM  Book Sales! We will have a selection of landscape books for sale. 6:30 PM  Board of Directors Election and speakers will begin presentations. Everyone on Maui deals with these pesky critters. Rennie will discuss the different types of snails and slugs and how the 2 differ in biology and how to use this knowledge to control them in our landscapes. He will also bring information on new chemical methods. Rennie Kubik has a degree in Agronomy and Soils from Washington State University. He is currently employed with Amvac Environment Products. Fred will talk about the use of cultural controls for our landscape and turf weed issues. These controls include water management, fertility considerations, plant selections and use of mulch for weed management. 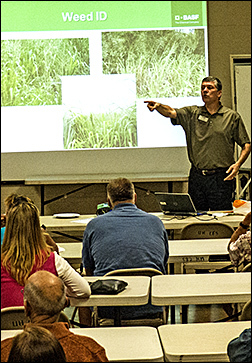 He will also talk about the proper and timely use of post and pre-emergent herbicides and the importance of weed identification. Fred Eckert is the Senior Sales Specialist for BASF Turf & Ornamental Group. He holds a degree in Soil Science from Cal Poly San Luis Obispo. There will be a raffle at the end of the meeting. Each attendee will receive one free ticket. Additional tickets can be purchased for $1 each.